Topping any list of hotels for the Alhambra has to be the stunning Parador de Granada. 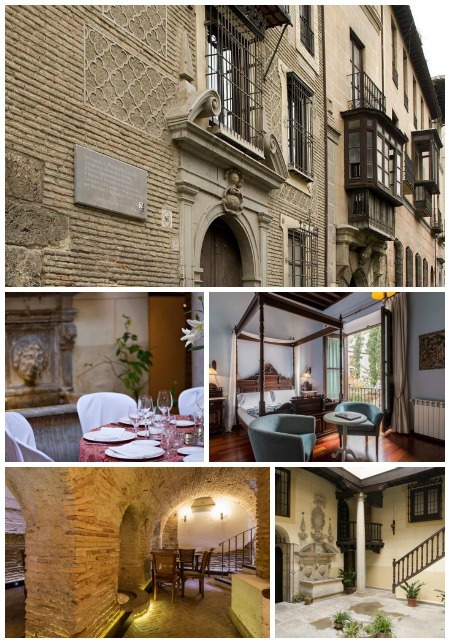 Set in the 15th century San Francisco Convent, within the grounds of the Alhambra itself, this hotel is steeped in history and boasts one of the most romantic locations in the city. It was built, by order of the conquering Catholic Monarchs, on the site of one of the Nazrid palaces. This historic building offers an effortlessly stylish combination of original features, such as stone archways, beamed ceilings and antique furnishings with smart, contemporary décor. From the restaurant dining room and terrace you can take-in spectacular views of the Generalife Gardens while enjoying traditional Andalucían fare. There is also a charming enclosed courtyard, where guests can relax and keep cool with a drink. Granada’s old town is an easy 10 minute stroll downhill from the Parador. There are also regular buses and plenty of taxis available. 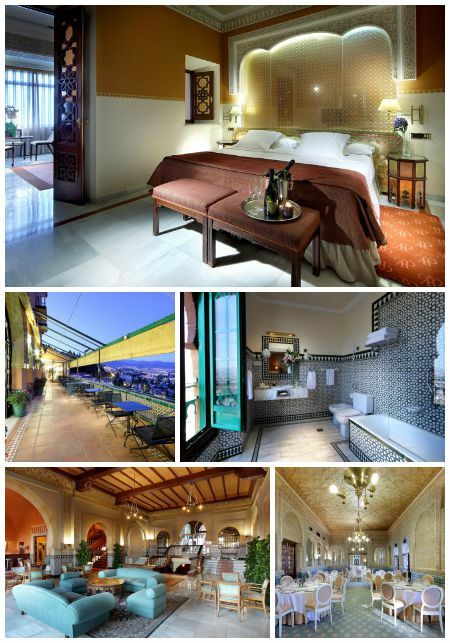 For more details on visiting the Alhambra click here. Hotel Alixares is in a great location just across the road from the main entrance to the Alhambra and offers great panoramic views of the city and the Sierra Nevada Mountains. It has a seasonal outdoor pool which is a fantastic bonus after visiting the Alhambra on hot summer days. The Alixares has two restaurants and a terrace area with spectacular views. There is also a bar and café, and a summer terrace with barbecue. The Alixares offers comfortable, functional rooms with air-conditioning, flat-screen satellite TV and there is free WiFi throughout. The city centre is a pleasant 15 minute walk downhill or you can take a taxi or use the regular bus services connecting the hotel to Granada city centre. Hotel Alixares is easily accessible from the A-44 motorway, and private on-site parking is available (reservation is not possible) and costs €15.50 per day. 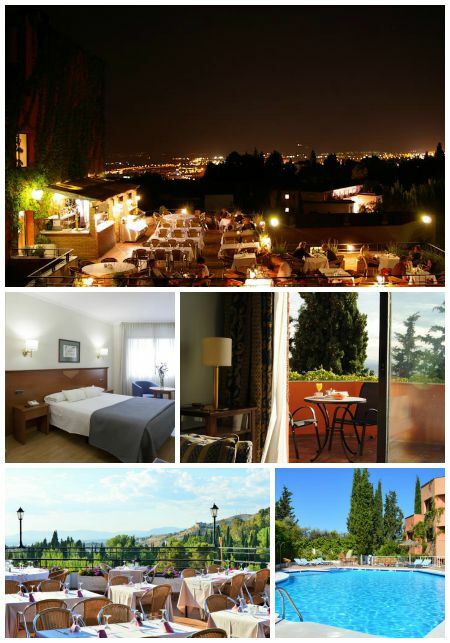 Paseo de la Sabica, 40, Granada, 18009 | doubles from €100 B&B | 4 Star hotel with pool and stunning views. By far the grandest on the list is the Alhambra Palace which is set just outside the Alhambra’s ancient walls. It is only a short walk along shady paths from the monument’s main entrance and enjoys some of the most spectacular views of the city and Sierra Nevada. The hotel has a palatial, old-world elegance, if slightly fraying at some of the edges, and features bedrooms with Moorish-inspired décor, free WiFi and satellite TV. The hotel restaurant serves good traditional Andalucían food and you can also get a cup of coffee or a cocktail in the terrace bar while feasting on the fabulous view. It is a 10 minute walk to the Plaza Nueva and the Albayzín, the medieval Moorish quarter. A bus stop directly opposite the hotel will take guests to and from the Alhambra or city centre. Valet parking is available at a location nearby (reservation is not needed) and costs €17 per day. Palacio de Mariana Pineda is named after the revolutionary martyr of that name, who lived on the site in the 19th century. Information on it’s history can be found in the hotel’s fascinating museum. 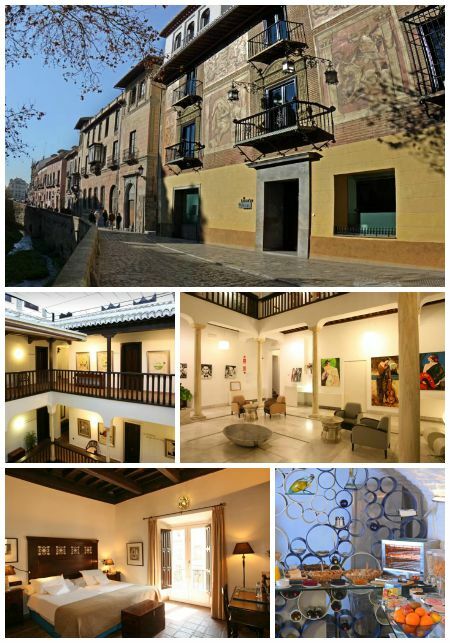 Located on Granada’s most beautiful street, the Carrera del Darro, this exclusive hotel offers only five rooms. Also located on Granada’s romantic Carrera del Darro, is the elegant El Ladrón de Agua which is named after ‘The Water Thief’, a poem by Juan Ramon Jimenez, inspired by a trip the poet made to Granada in 1924. The poem is part of a collection called ‘Olvidos de Granada’, Forgotten Memories of Granada, an original edition of which is housed in the hotel’s library. 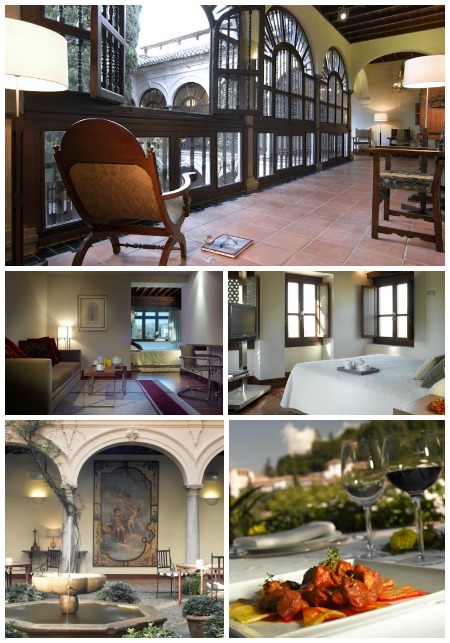 Once a home to Christian nobility of the 16th century, the building has been beautifully restored and offers 15 bedrooms all named after Spanish poets. The hotel, in keeping with it’s artistic roots, showcases local and regional art. All rooms are individual in design and have air conditioning, flat screen TV and free WiFi. The hotel is ideally situated only minutes away from Plaza Nueva, Calle Elvira and within walking distance of the Alhambra. Access by taxi is advised. If you are driving you can park at Palacio de Congresos which has a taxi rank just outside. Click here more recommendations on hotels in Granada City and here for our quick guide to the Alhambra.